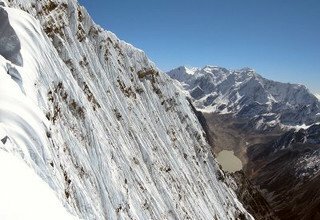 The Ramdung Peak is situated in the borders of Khumbu and Rolwaling valley in the eastern side of Nepal. 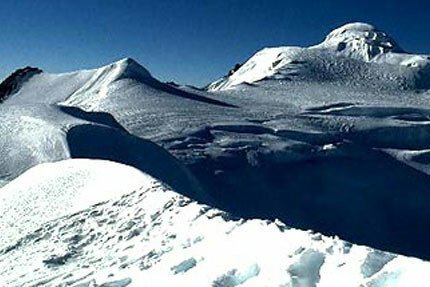 The Ramdung Peak Climbing enchants you with magnificent views of the mountains such as Everest (8848m), Melungtse (7181m), Gaurishankar (7134m) and takes you to the beautiful ice glacial Lake of Tso Rolpa which is one of the natures wonders of Nepal. 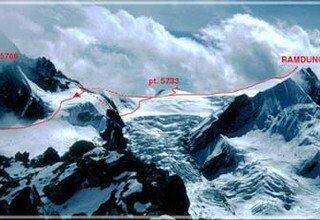 At 5,930m this is a climb which is not very technical or difficult but is challenging given the strenuous nature and the remoteness of the area. This offers an unreal proximity to the Himalayas and serene nature. Our journey will begin in Simigaon from where we will mainly ascend and pass through the dense jungles, beautiful suspension bridges, cross fast flowing rivers and deep valleys. 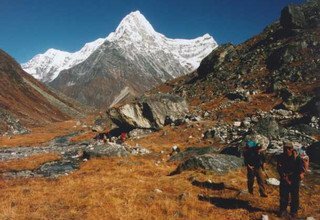 This trek allows for fabulous views and is suitable for anyone who aspires to walk long distances without any hints of modern luxuries. 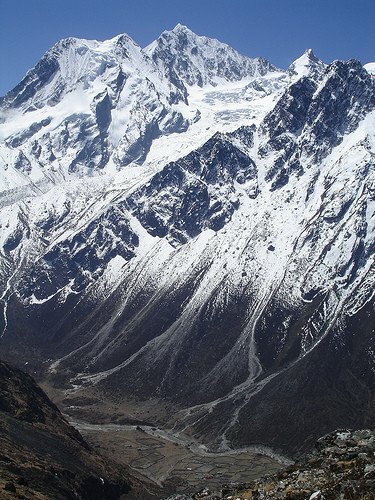 We will make our way through many Sherpa villages along this trek. The natives of this region, the Sherpa have naturally acclimatized for high altitude. 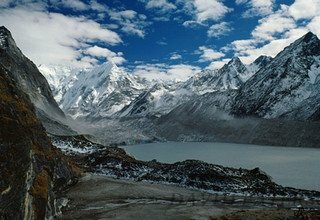 With the Himalayas as their backyard, they are able to lead normal lives at such great altitudes and thus are the backbone behind any travel journeys. 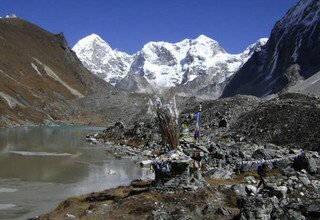 This trek allows for us to understand the culture and tradition of the Sherpa people and their deep-rooted relationship with the mountains. We will have allocated acclimatization day during this trek and will be guided by our guides and trekking experts along the way. This is also a chance to see the incredible flora and fauna that Nepal has to offer. The region is also a home to the elusive snow leopard and is found in almost all foothills of the mountains. Keep an eye for them during this trek also. 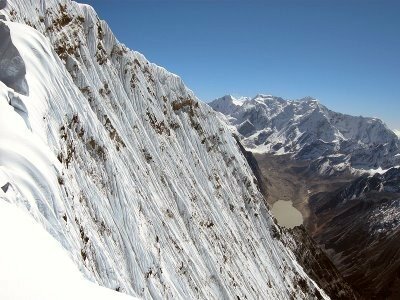 Overall, this peak climbing is a great option to take a taste of mountaineering along with ancient culture to greet us throughout the journey. With 15 years of experience and fluent English-speaking guides, we at Swiss Family Treks and Expedition make it our concern to give you the best hospitality service. Whether it be through the plains with thick jungles and grassland or the snowcapped mountain travel, we provide excellent transportation and accommodation facilities to our clients. Welcome to Kathmandu, as you exit the airport, our representative will meet you and transfer you to your hotel. Overnight at a 3-star hotel in Kathmandu. Today, we will get to witness the culture, architecture and religious tolerance of the city inherited from earlier times. We will visit the famous Pashupatinath temple which is the biggest religious site for the Hindus. We will also visit Boudhanath stupa which reflects the culture and philosophies of Buddhism and is one the largest stupas in the world. We can see the brilliant confluence and tolerance of the two religions which helped flourish the city. We will end our day in Swayambhunath from where the valley is visible and watch the brilliant sunset. Overnight at a 3-star hotel in Kathmandu. We will move early in the morning to Gonghar as the highways in Nepal are infamous for its traffic and are often under repair due to rainfall and landslides. Our path will be crossed with lush green hills, forests, fast rivers and occasional glimpses of Himalayas. The trek to Simigaon runs through suspension bridges, thick jungles, and small tea shops. Overnight in Simigaon. As we move, we will be passing through a few Sherpa settlements and if we have the clear sunny day we will be blessed with an incredible view of Gaurishankar (7,134m) towering above the Rolwaling valley. The rocky trail passes through a wooded ridge followed by dense pine forests with plenty flora and fauna as we descend to Rolwaling river and reaching Dongang. Overnight in Dongang. 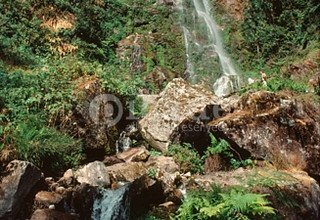 Ascending uphill through rhododendron forests and keeping the Rolwaling River to our side, we move further up into the deep valleys of this region. With Gaurishankar (7134m) keeping us company, we will reach a flat terrain with terraced faming. Crossing this we will enter a beautiful Sherpa village called Beding situated right next to the river. Overnight in Beding. We stay at Beding today to acclimatize. Acclimatizing is key for a successful trek and its importance cannot be stressed enough. We will make short treks around the region to view Gaurishankar (7134) and other peaks which are plenty in this region. We also get to closely observe the lifestyle of the inhabitants during the exploration. Overnight in Beding. Going up next to the river the trek takes to explore the surrounding Yalung glacier today. An open space this place has some livestock grazing in its fields and other flora and fauna can be witnessed too. With panoramic views of the mountains in front of us, we reach the Sherpa village of Na. It is also one of the oldest known settlements in this region of the country. Overnight in Na. We wake up early in the morning and enjoy the sunrise as the radiant light reflects on the white snowcapped mountains. We will trek past Ramding La pass (5665m) which offers enchanting views of the panoramic mountain ranges. 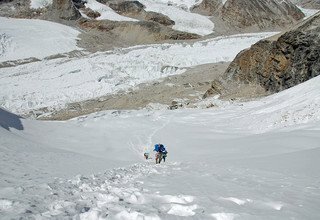 As we reach the High camp, excitement grows about the summit next day. 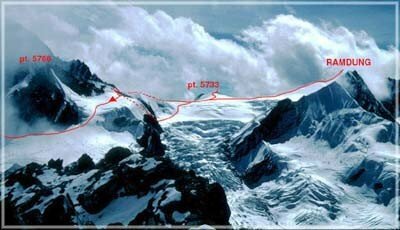 We will also be briefed by the guides on the do and don’t on the climb to the peak. Getting up before dawn, we will make our way to the summit. Trekking for good 7 hours on a steep rocky platform we will reach the top. A strenuous walk, once we reach the top we will witness an absolutely mind-numbing view which stalls every one of our senses. We will be blessed with views of Everest (8,848m), Gaurishankar (7,134m), Melungtse (7,181m), numerous other mountain ranges and a lot of glaciers. 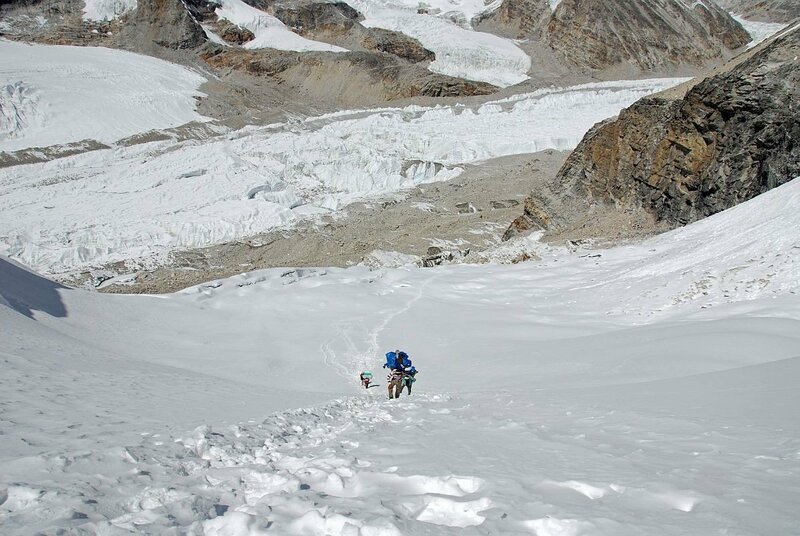 The accomplishment of climbing this peak will leave us with a feeling of overwhelming joy. 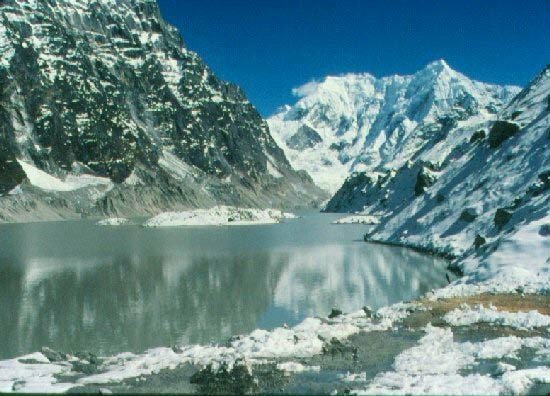 After taking some pictures, we will start our descent to Tso Rolpa which is a beautiful high altitude glacial lake and also gives a wonderful view of the Langtang Himal (7227m), Pachermo Himal (6,273m). During the night time, we will be able to see beautiful stars in the sky and is a perfect time for astrophotography. Overnight at tented camp. Through similar paths, we will make our way back to Beding with magnificent views of Rolwaling Himalayan range, Pachermo (6273m) and a mountain fondly called as Tilicho’s brother. With the images of Tso Rolpa still fresh in our head, we will reach Beding and give much-required rest to our tired legs. Overnight in Beding. Waking up in the morning, we can begin to recall our experiences of the precious days. Bidding farewell to the trail we previously made an ascent, we head to Daldung La after taking a different route from Thangthing Kharka. We will walk through trails with much foliage and dense bushes. There are many rhododendron trees paving the way and many varieties of birds and animals can be seen thriving in their habitation. Overnight in Daldung La. 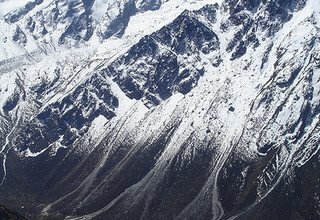 From Daldung, we will lose considerable altitude and make our way to Manthali. Headquarter of Ramechhap district, it is a beautiful valley cut by the Tamakoshi River and is a big town compared to the ones we went through in our trek. This also marks the end of our trek in the beautiful Rolwaling region. Overnight in Manthali. Day 14: Drive back to Kathmandu 8-9 hour and transfer to Hotel. Today’s drive is a long one and can worsen given the state of traffic. With beautiful views of the hills, jungles, occasional mountains and rivers we will make our way to Kathmandu and reach the hotel. After that, we will take a much-needed rest for the day. You can stroll around the areas later this day. Overnight at a 3-star hotel in Kathmandu. Today, we will spend our time relaxing and shopping for souvenirs in the city. Filled with little alleyways and gullies, numerous hours can be spent in the little cozy shops. This is a great day to try out some local delicacies. Woolen clothes and pashmina are a great choice for travelers to shop. Overnight at a 3-star hotel in Kathmandu. Day 16: Final Departure to International Airport. Our staff will drop you at the airport around 3 hours prior to your scheduled flight, ending your journey. * 4 nights accommodations with breakfast at Standard hotel in Kathmandu. * Rolwaling Valley Conservation Area Permit and all necessary permits. 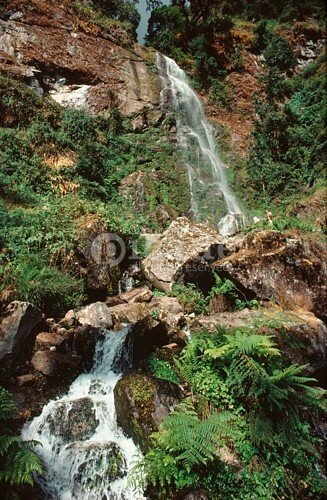 * Rolwaling Valley Restricted Permit.